​SEE has been administering the Academic Integrity PSA contest since the 2014-2015 school year. The contest invites Connecticut high school and college students from public and non-public schools to create a PSA with a student perspective that advocates for the practice of academic integrity. Release info: All participants and their school will need to sign a release, allowing SEE to take ownership of PSA. Academic Integrity PSA contest winners at the 2015-2016 Celebration. The creators of the top three PSAs as judged by professional videographers are invited to SEE's annual Character Celebration dinner, which is typically on the first Wednesday in May at banquet facility in New Haven. Students, two family members, and teachers are invited to participate in the celebration. The winning PSAs are shown at the Celebration. View pictures from the 2017 Celebration Program. 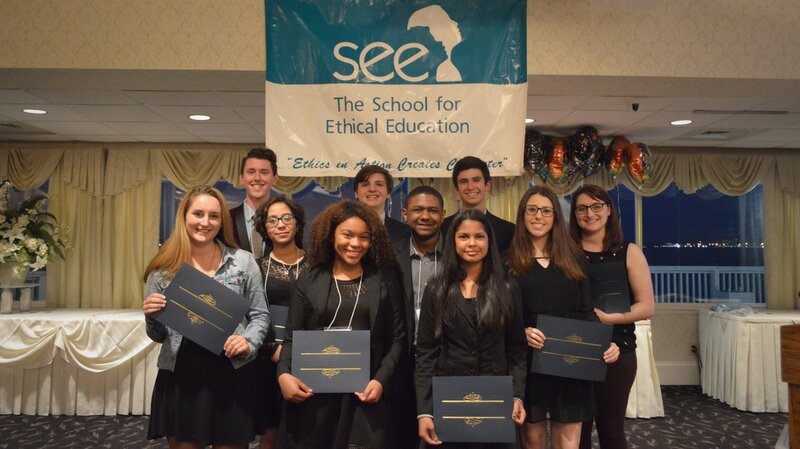 ​SEE's Academic Integrity PSA contest has been approved for implementation in Connecticut schools by Connecticut Association of Schools (CAS) and endorsed by the International Center for Academic Integrity.​ SEE is grateful for start up funding for this project from the Richard Davoud Donchian Foundation.